PAROC Pro Segment 140 Clad T is a ready cut segment for medium and big size pipe elbows made of non-combustible stone wool pipe section. It is used for thermal insulation of industrial pipework. 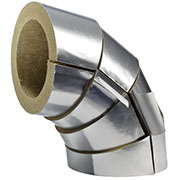 It has durable and water tight aluminium facing and tape in a longitudinal seam which helps installation.